rumali roti is one of the unleavened indian breads that is made traditionally in the awadhi, mughlai and hyderabadi cuisine. 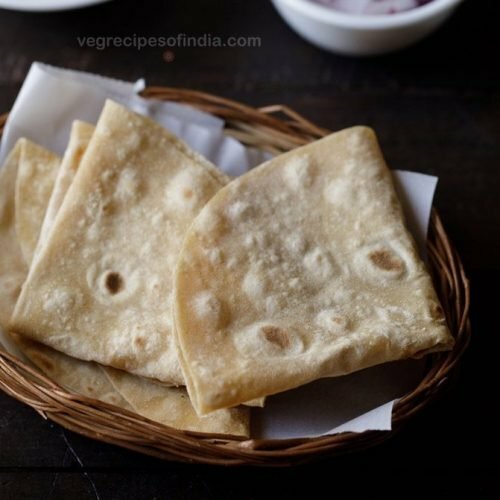 rumali roti are thin soft rotis and can be folded like a handkerchief. hence the name rumali or roomali roti. the word 'rumal' means handkerchief in hindi language. in a large bowl or a parat (wide rimmed plate) take 2 cups whole wheat flour (240 grams atta) and ½ cup + 3 tablespoons all purpose flour (80 grams maida). also add 1.5 teaspoon salt or add as required. add 1.25 to 1.35 cups water in parts or intervals. mix and begin to knead. adding water in parts knead to a slightly sticky dough. cover the dough with a moist cotton napkin or muslin. keep aside for 30 minutes. after 30 minutes again knead the dough. make medium sized balls from the dough. cover with the moist cotton napkin and keep aside. take a dough ball and sprinkle some whole wheat flour (chapati atta) all over. with a rolling pin (belan) begin to roll the dough. while rolling sprinkle flour evenly all over if the dough sticks or gets sticky. roll to thin rotis having 11 to 12 inches diameter. do not add too much flour when rolling. add only enough flour which will help in rolling. if there is a lot of flour covering the rotis, then the rotis will become hard. roll to thin and slightly transparent rotis. also roll evenly and keep edges thin if they become thick. now invert concave tawa or kadai with a long handle. its better to have an handle on the tawa. keep the flame to medium or medium-high. sprinkle some flour on the tawa. if its become golden, then the temperature is fine on the tawa. if it burns quickly as soon as you add flour, then reduce the flame. gently place the roti on the inverted tawa. begin to roast roti on medium to medium-high flame. you will see bubbles appearing on the roti. with a clean folded cotton napkin, press the edges, center and sides so that the roti gets cooked. roast for 40 to 45 seconds or till you see bubbles all over. do not cook too much or rotis become like papads. then flip with the help of tongs and roast the other side. at this step too press the rumali roti with the napkin. cook the second side for 30 to 35 seconds. timing will vary depending on size, thickness of pan and flame intensity. flip and place in a plate. you can spread some oil or ghee on the rumali roti if you want. then fold with the help of tongs and serve hot. this way make all roomali roti. serve rumali roti hot or else they become chewy. serve roomali roti hot with north indian main course of dal or curries.